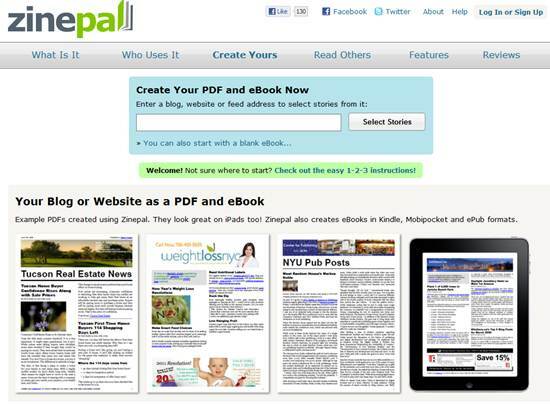 Zinepal is a Free web based service that allow you to create your own printable PDF magazines and eBooks from any online content. You can select content from your favorite blogs, Atom/RSS feeds and other websites. zinepal.com reformats the content into a printable PDF and an eBook for use with the Amazon Kindle and other eBook readers. Print it, read it on your eBook reader or e-mail it to your friends. It give you freedom to take your content wherever you go. 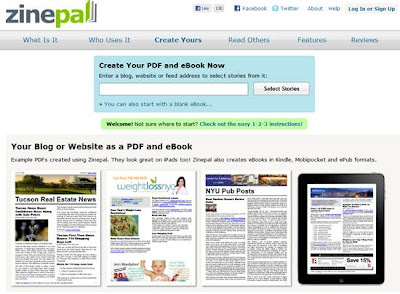 Zinepal is a very easy to use. Just Add the URL of blog or blog feeds that you want to create printable PDFs, magazines. Select the entries you wish to add to the zine, preview your content, customize to your Main Feature content, and you're all set. Zinepal now create your own printable PDFs, magazines from your favorite blogs, Atom/RSS feeds so you can easily share your Zine with your friends and Publish to Kindle/Mobipocket and ePub.